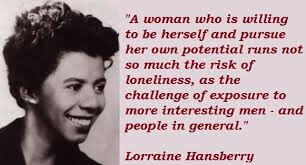 Lorraine Hansberry, the first Black American woman to write a play performed on Broadway. Posted on January 19, 2015 January 18, 2015 by Von SimeonPosted in Art, Culture, Inspiration, Literature, Philosophy, Politics, Pop Culture, WritingTagged A Raisin In The Sun, Equality, Feminism, Lorraine Hansberry, Martin Luther King Jr Day, Racism. Hello Von! I’ve decided to read and follow 15 interesting and new blogs a day every day for the first month of 2015, and yours is today’s #9! Feel free to come visit me when you can at http://www.thatssojacob.wordpress.com, and follow if you like what you read. Happy new year and happy blogging! WOO HOO! I MADE #9!! Thank you for the follow TSJ 🙂 we’ll hang out soon.